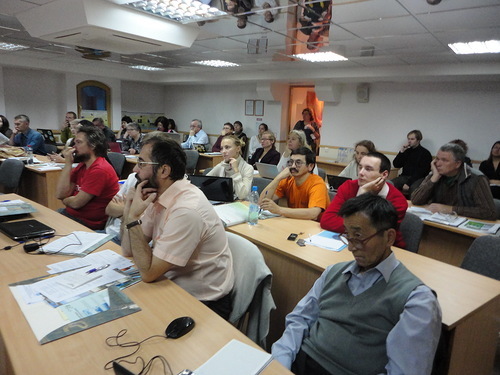 Environmental activists from all the regions of Russia, from the Far East to Murmansk, gathered in Strelna, near St.Petersburg, on the 27 til 28 of October to discuss public expectations and measures that are necessary to implement energy efficiency and reduce GHG emissions in Russia. The conference was organized by the Russian Socio-Ecological Union which unites over 200 NGOs and over 300 independent members, many of whom actively work towards implementing energy efficient solutions in their regions thus saving our climate. Negative consequences of climate change are of major importance for Russia which is one of the biggest emitters of GHG gases and is largely responsible of the issue. Fossil based energy production is a key contributor to climate change. At the conference different scenarios of the energy sector development as well as necessary measures to reduce emissions were discussed. The conference program may be found here. According to many experts, Russia’s national emissions reduction goals (of 15-25% by 2020 based on the 1990 level) are extremely weak. Since at the moment the country’s GHG emissions are about 35% below the 1990 level, it means that the adopted national goals imply the emissions growth by 20% which does not correspond at all to the acclaimed objectives of the energy efficient modernization of Russian economy. 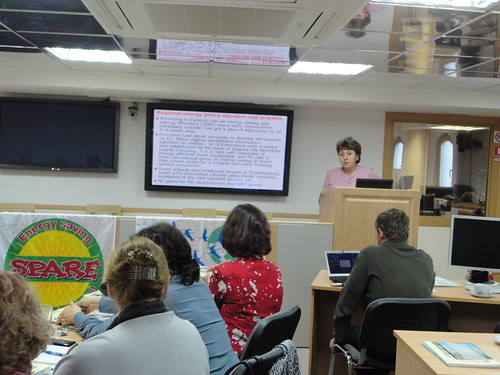 Alexey Kokorin, the WWF expert from Moscow, presented different scenarios of Russia’s GHG emissions dynamics. Among them, for instance, there is a WWF scenario of reducing emissions without taking nuclear power stations into account but taking in mind the transportation of energy from solar sources northwards. The International Energy Agency has their own models and scenarios that do not imply the use of nuclear materials and fossils. Energy saving and demand reduction, according to IEA, may reduce the emissions twice. And renewable will add up to 30% to these numbers. Igor Babanin of Greenpeace St.Petersburg presented the forecast til 2050 which was prepared as part of INFORSE-Europe project. The forecast is based on a detailed analysis of different types of renewable in Russia and of energy efficiency in different energy sectors, such as housing, industry, transport etc. Speaking of Russia’s climate policy and NGO participation Olga Senova of Friends of the Baltic/RSEU Climate Secretariat emphasized that based on expert assessment our NGOs claim it to be appropriate for Russia to adopt more ambitious goals, to ‘feeze’ current emissions and proceed with reducing them. This will help us reduce our emissions by at least 35% by 2020 from the 1990 level. Apart from this, it is necessary to link emissions reduction goals to the corresponding goals of increasing energy efficiency and the share of renewables. At the moment, by the way, the number mentioned in Russia’s Energy Strategy until 2030 is 4,5% - the share of renewable energy. According to the forecast by INFORSE-Europe, solar and wind power will constitute up to 3% of total energy consumption by 2020, 9% by 2030 and 22% by 2040 and then up to 37% in 2050. The use of heat pumps is expected to grow, especially after 2030. By 2050 it will cover 59% of district heating demand. Considering other renewable energy sources, such as biofuel, geothermal energy, tidal waves etc, Russia’s potential of replacing carbon-based and nuclear energy production is very significant and this should be reflected in strategical documents. Alexander Martynov of Interfax-ERA presented his report on environmental energy ratings of Russia’s regions. According to Askhat Kayumov (of Dront, Nizhny Novgorod), this kind of ratings may stimulate companies to implement energy saving technologies and to reduce energy intensity of production. At the end of the conference, the participants took part in working groups on a joint Russian-Ukrainian-Belorussian position to Durban, on the analysis of national energy policy on climate and energy and the barriers to promoting renawables and energy efficiency. These materials will be published in the nearest future. The conference’s participants discussed a RSEU campaign that is now being planned for 2012 entitled “Energy efficiency as the most powerful and cleanest energy source in Russia”. It will take place from April to December of 2012 all over Russia.